"Feeding refugees: Marsh refugees enjoy a hot meal in the Bradford town hall after their flight from the flooded Holland Marsh. Most spent the winter in an emergency trailer camp set up where the community centre stands today." Debris from the marshland piling up along Highway 400. 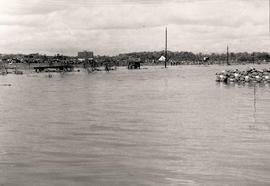 Photograph from Betty Kennedy's 'Hurricane Hazel,' found in the Local History Collection. 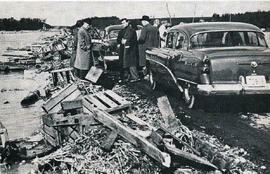 Holland Marsh farmers return home to salvage belonging. 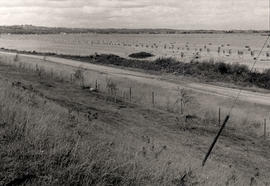 Photograph from in Betty Kennedy's 'Hurricane Hazel,' found in the Local History Collection. 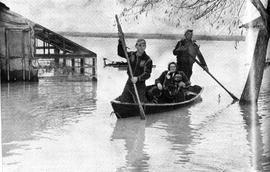 This article lists the members of the Emergency Relief Committee for the Holland Marsh Flood due to Hurricane Hazel. 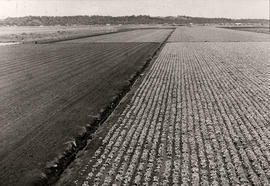 Photo is taken facing north prior to the flood of Hurricane Hazel (October 15, 1954) Lettuce in foreground is #9654 lettuce. Hand dug ditch is also illustrated. Front page of the first Bradford Witness paper after the Holland Marsh flood due to Hurricane Hazel on October 15, 1954. 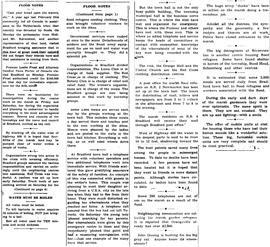 See Related Descriptions below for individual stories of this edition.